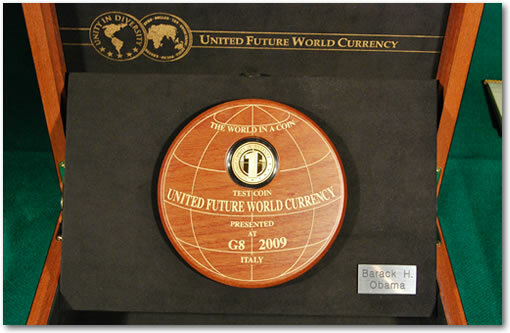 The sample of the first "test" currency from the international project for a new virtual global currency, given the draft name, "United Future World Currency – Eurodollar," was presented as the exclusive gift to Heads of State and Government at the G8 Summit: Barack H. Obama, Dmitij Anatolyevich Medvedev, Gordon Brown, Nicolas Sarkozy, Angela Merkel, Silvio Berlusconi, Taro Aso, Stephen Harper, Josè Mauel Barroso, Fredrik Reinfeldt. The final name and symbol for the new currency will be decided in a competition for children in 1000 schools throughout the world, organised by the Museo del Tempo. The initiative began in Italy and enjoys the patronage of the Italian Prime Minister’s Office and the Italian Treasury. Although the initial aim is to unite the United States of America with the United States of Europe, it will also be open to other Countries. The example of the Euro, which united Countries with different histories and cultures under the same currency, is a concrete precedent that demonstrates how this project can indeed come to life and gather together nations from several different continents. In sending his best wishes for the project to its coordinator, Sandro Sassoli, Prime Minister Silvio Berlusconi emphasised that, "It is interesting that young students from different countries can get involved in an international project that helps them understand certain aspects of international economic policy, allowing them to prepare for the future monetary union that we hope for." In 1996, Sandro Sassoli conceived the idea of the UFWC project, having taken advice from Arthur Schlessinger Jr, former adviser to President John F. Kennedy. An international jury, comprising the heads of the world’s leading mints, economists, Nobel-prize winners, and figures from the world of culture and journalism, will have the task of selecting and rewarding the children’s best work concerning the new currency. The Royal Mint of Belgium, one of the world’s most prestigious mints, has been the first to issue a test coin for this new currency, a special rare gold edition that was gifted at G8 Summit. 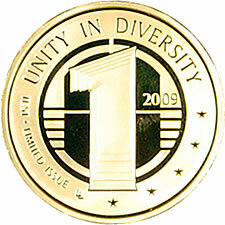 The coin has been designed by Luc Luycx, author of the common side of the Euro coins. The project will study security and anti-counterfeit measures; meanwhile, experimentation to seek innovative solutions for an "intelligent" money are also underway. The currency will also undergo an important public test run at the 2015 Milan Universal Expo. www.futureworldcurrency. Info in English Tel +393358792124 – info@futureworldcurrency.com.